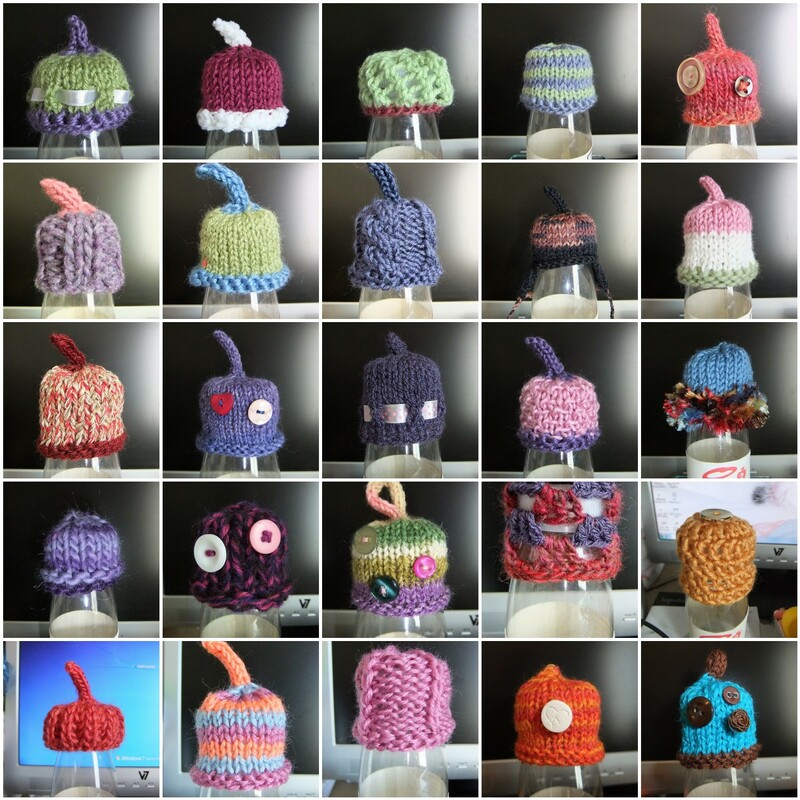 I was browsing the Knitting Blogs on Sunday, and got a shock when I read on JosieKitten's blog that the deadline for Innocent Smoothie Hats for The Big Knit is Friday 14th October. I have been merrily knitting away at one hat a week; I have been happily planning the next week's hat, and had completely forgotten the point of them all! So I got all my hats together, and I have 51. I've been trying one a week, so I have one to go, then I'll send them off, and make a start on next year's. 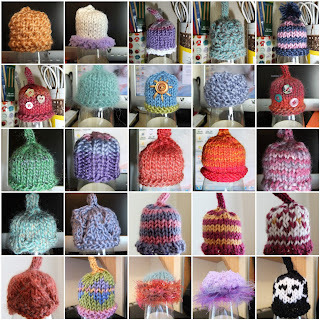 In a shameless copy of JosieKitten's post, here are all my hats so far. It's one of my long list of winter hats. I stumbled across the pattern on Ravelry. It's called Karin Kurbits Hat, and I have to say I love making it. I've done fairisle Smoothie Hats, but never anything bigger. It took a while to get used to the two yarns, and I can't really get the hang of holding the yarn in my left hand so I'm sort of swapping between the two yarns, but it's going well. I couldn't get the tension right on it, so after some calculations, I have made mine with five pattern repeats instead of six. I had a look through some of the projects on Ravelry, and quite a few people have done this. The multi-coloured yarn is Crystal Palace Mini Mochi. I always knew this would end up being a hat. And the grey yarn is Woolcraft Superwash Sock Yarn. Yep, it's quite a combo, but it works! I cast it on one evening, and was having doubts about the colours as the purple didn't seem to be much different than the grey, but when I looked at it in daylight, the colours stand out really well. The photo is very like what it is in real life. I've done a bit more than in the photo, but the colours become a bit difficult to see in artifical light, so it will be early evening/weekend knitting. Just as well JK let you know it's time to send Ozzy! Lovely hats well done, the little froggy will be difficult to part with I think. The big hat is looking good too. I love the little froggy hat! So cute! I have favourited the Mini-Mochi hat too, as I do believe I have some of that yarn in my stash!! It looks great! 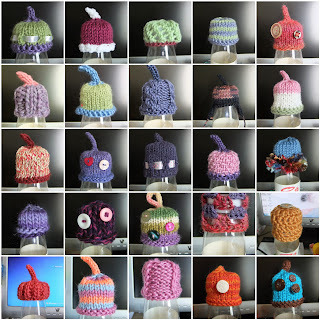 Cool hats, I especially love the little frog one. I haven't been knitting much at all. 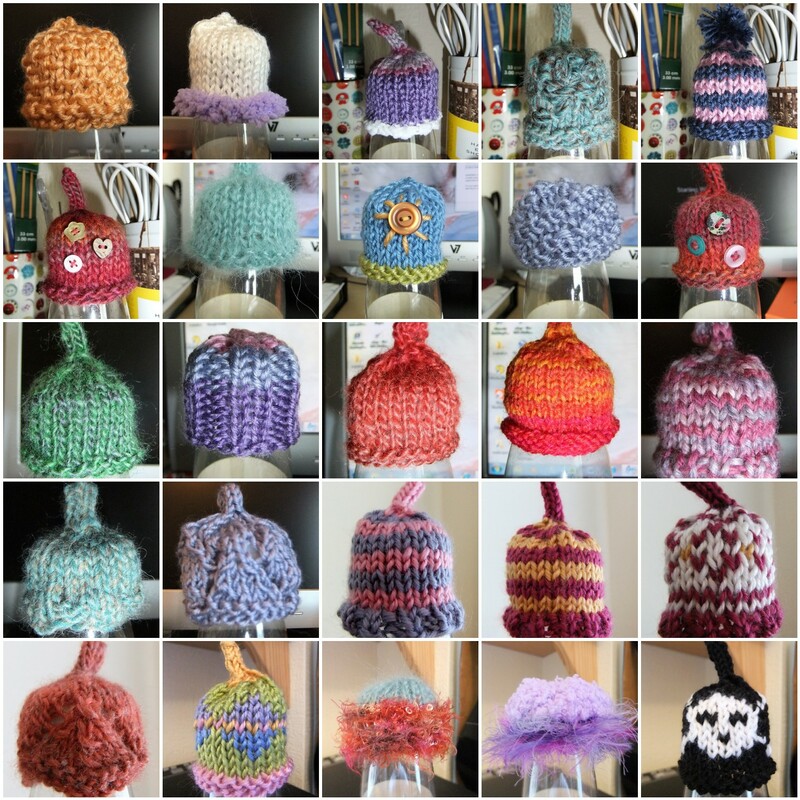 It's lovely to browse your blog to see what woollie delights you've been making. The colour work is gorgeous. Cute hats! I especially like the little i-cord toppers - much quicker than a pom-pom. I'll have to see about knitting some myself before the deadline passes.